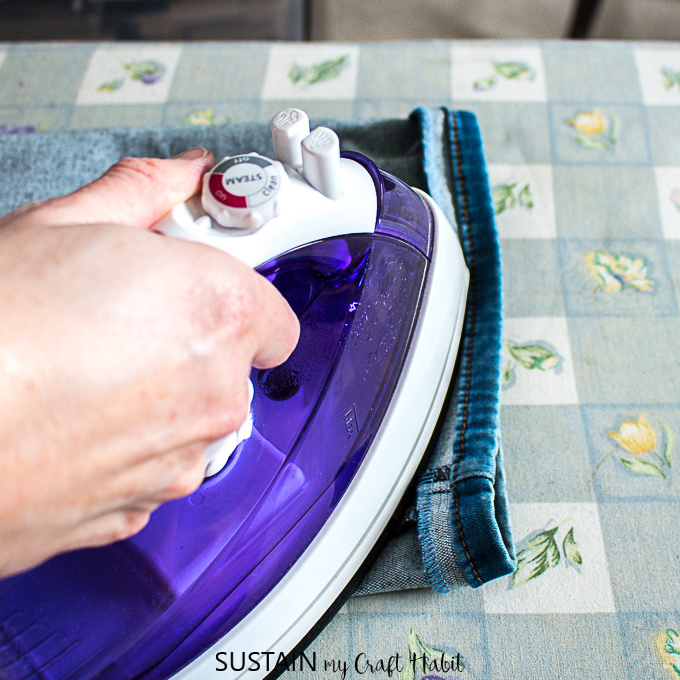 Ever since I started sewing as a teenager, I quickly became the designated seamstress in our family. My parents and sister would regularly give me their pants, skirts and dresses to hem or alter. 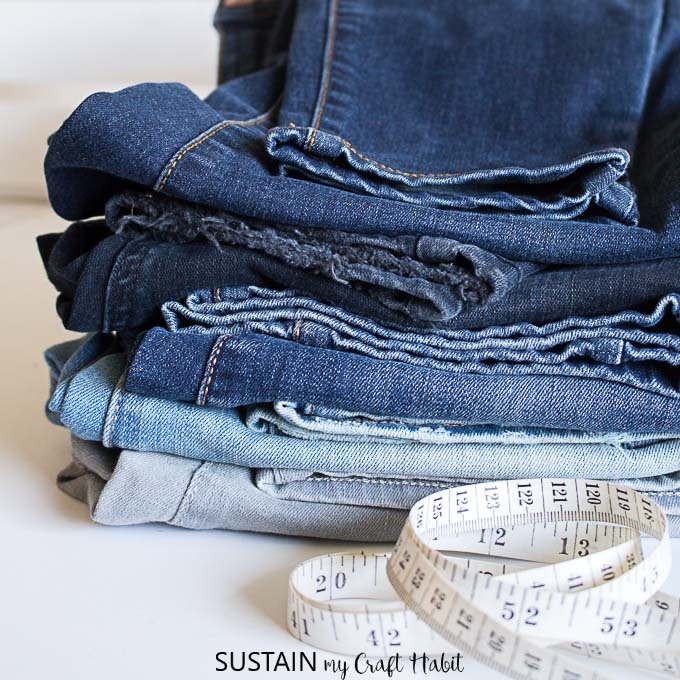 Over the years, I learned how to hem jeans by keeping the original hem and why this was one of the best ways to shorten jeans. 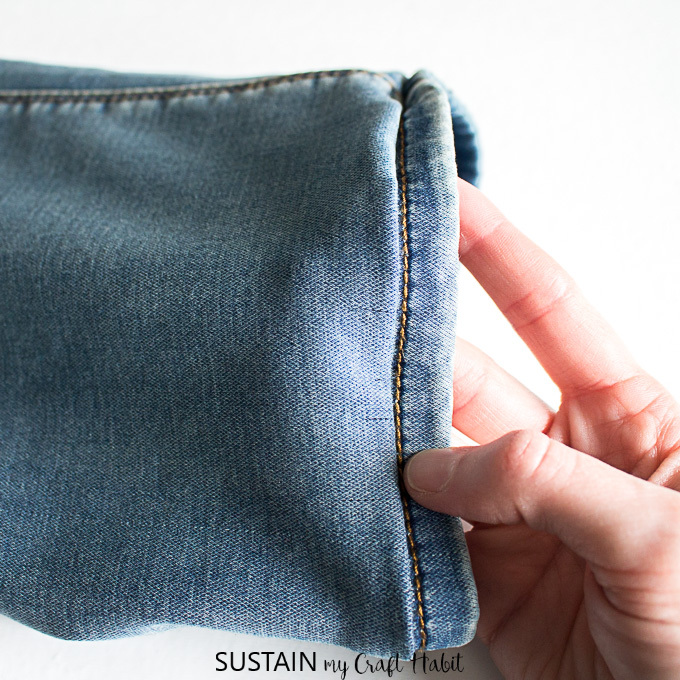 By keeping the original hem, you preserve the look of the denim with all it’s unique distressed and washed out features. Furthermore, you keep the contrasting thread color from the original hem. 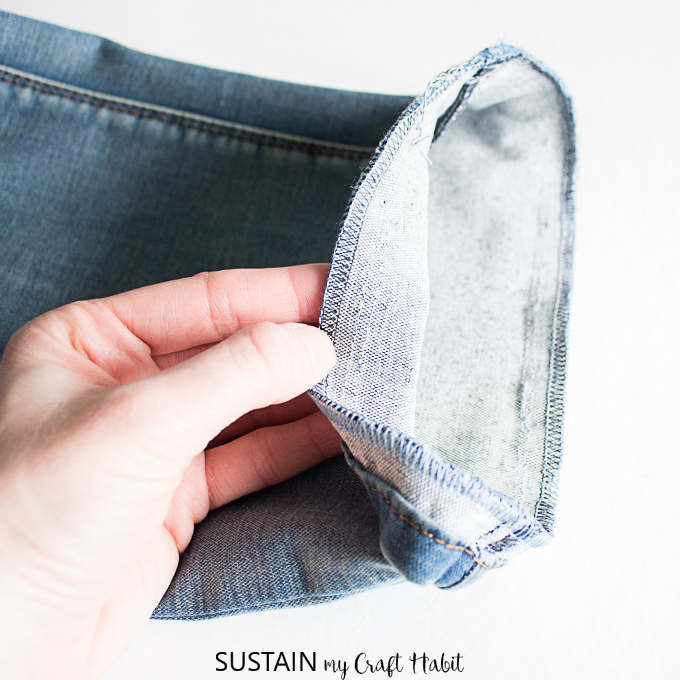 If you have jeans that are a dark indigo or black wash, than this method is not necessary although it still makes a great option. To this day, I have a pile of my family’s clothes on auto-replenish that needs altering in some shape or form. I promise to get to them eventually, I really do. And if you’re like me, and you’re holding on to jeans that no longer fit or are out of style, consider making a DIY repurposed denim checkered picnic blanket like I did here. 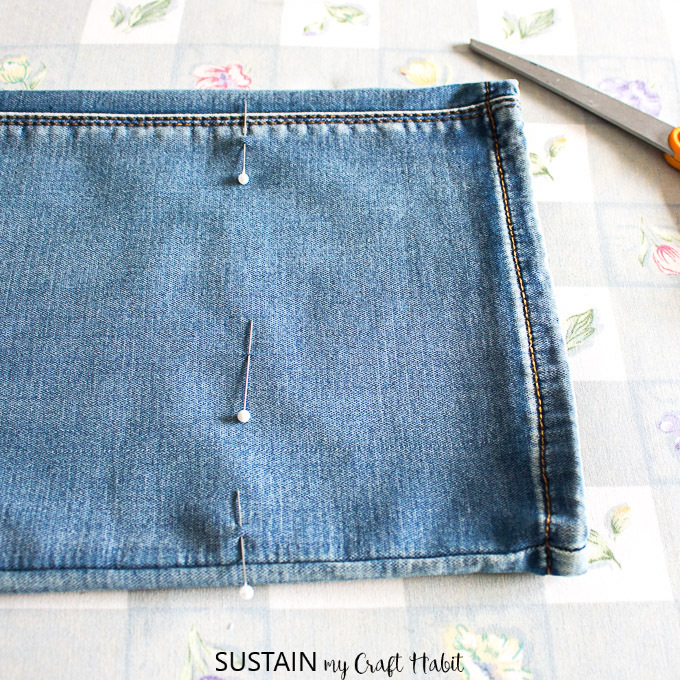 Put your jeans on and mark the desired length either by placing pins at the new hem or by folding the hem up. 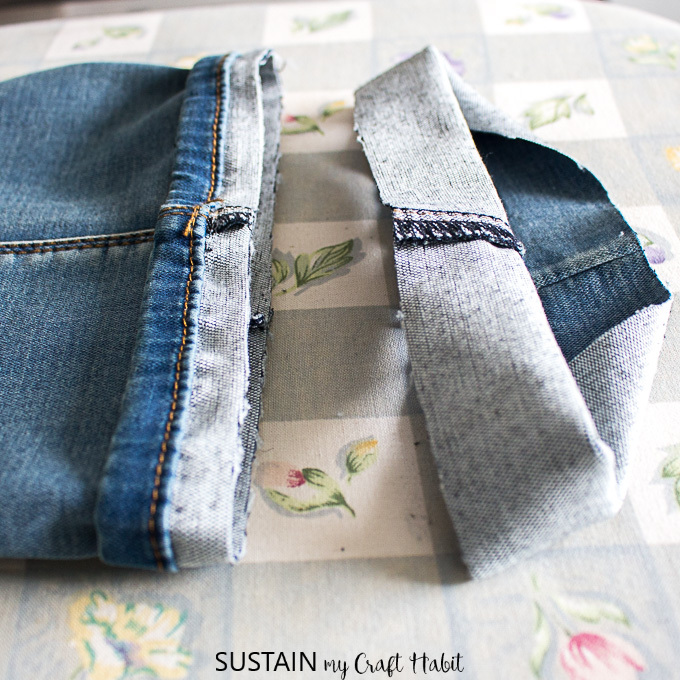 Lay the jeans on a flat surface with the hem folded up at your desire new length. 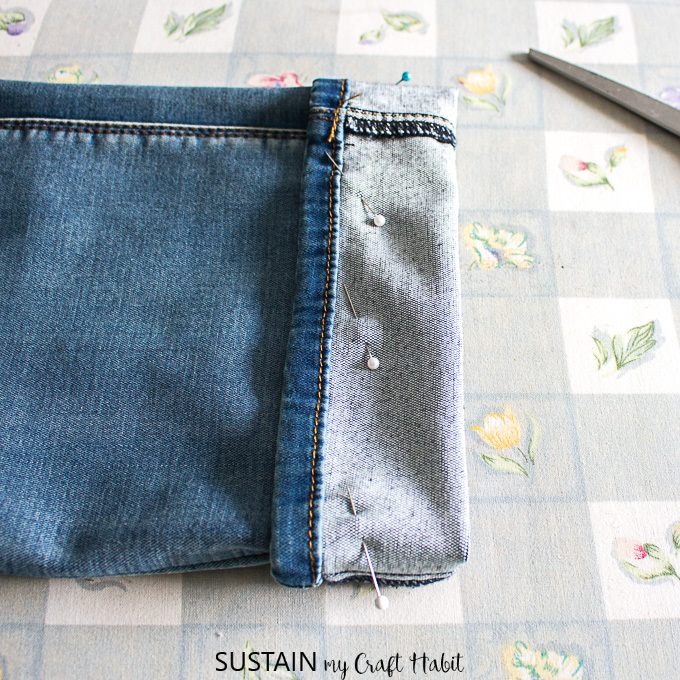 Shorten the hem by another 1/4″ (or the amount equal to the current hem height – hem edge to topstitching). 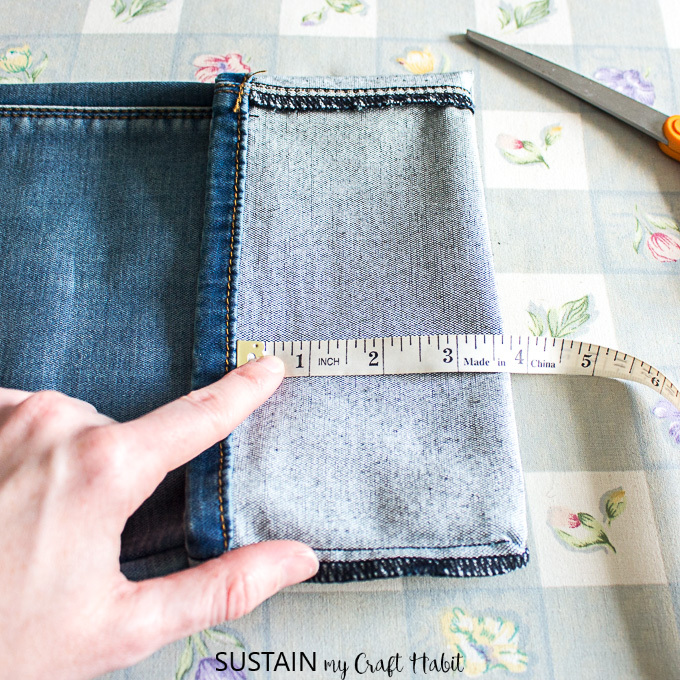 Next, measure the amount from the folded edge to the stitched hem as shown. In my example, the amount is 3 ¾”. Refold the hem by half the amount you measured previously. So in my example, I folded the hem at 1 ⅞” (this is half of 3 ¾”). Pin hem in place around the entire leg opening. 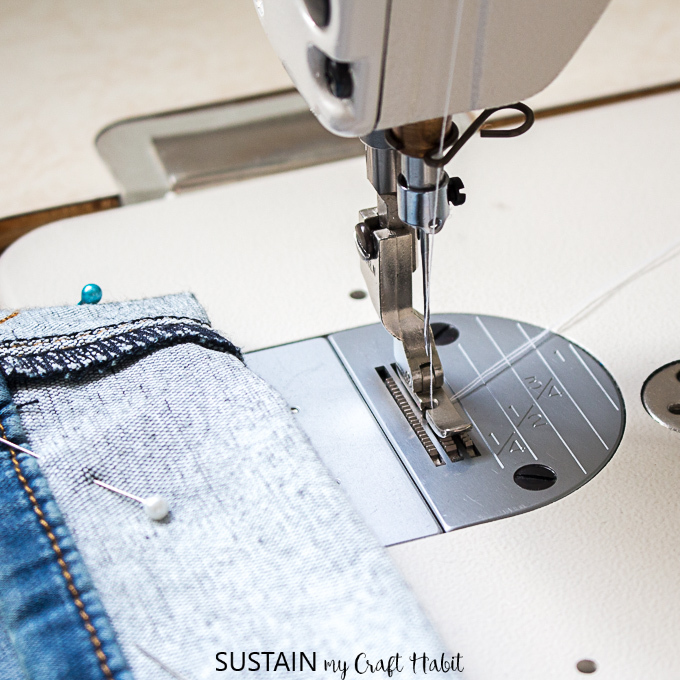 Using a right sided presser foot, insert the folded leg opening under the sewing machine. Stitch all the way around as close to the original hem as possible. Reinforce the stitches at the start and end of the stitch line. 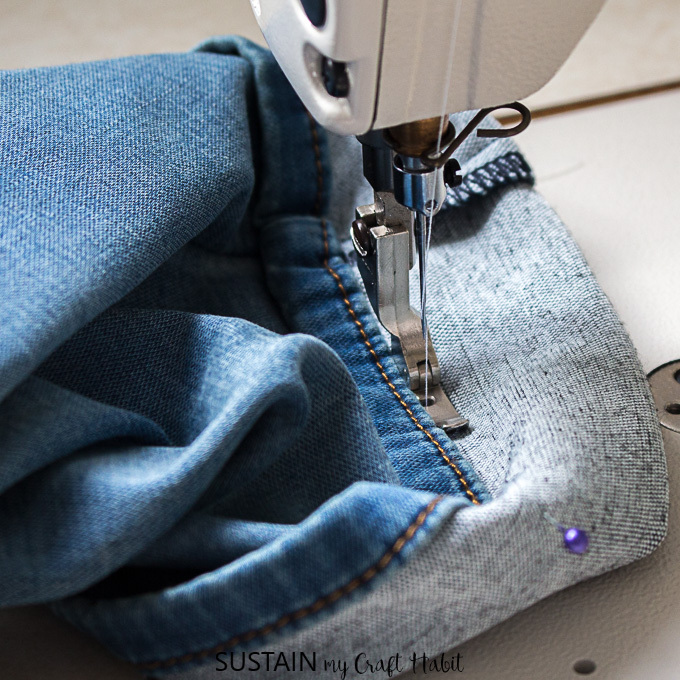 Take care to not catch the other side of the leg opening as you sew. 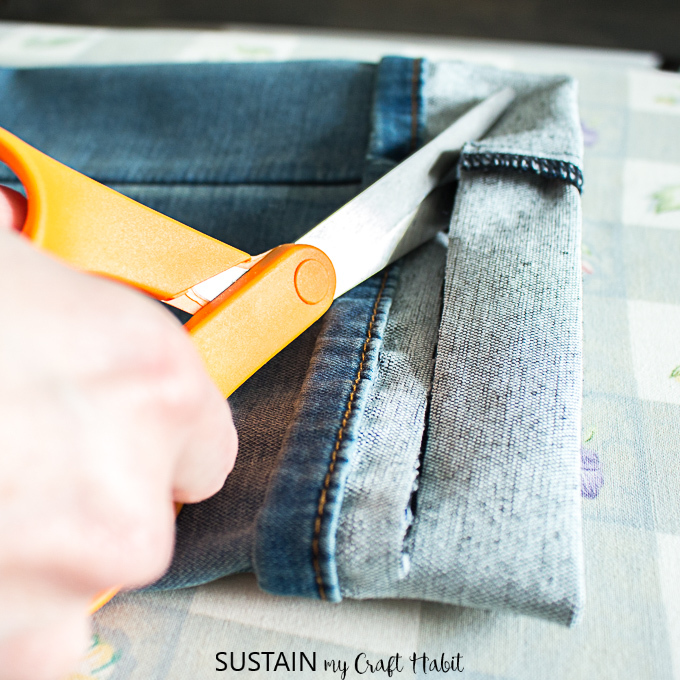 Cut the excess folded length leaving ½” seam allowance from the new stitch line. 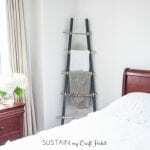 You can use a zig zag stitch or a serger to finish the raw edge. Since my industrial sewing machine doesn’t have a zig zag stitch setting, I’m using my serger to clean finish the cut edge. This is an important step to prevent the fabric from fraying. Stitch all the way around using a matching thread color to clean finish the raw edges. Fold the new hem down and press into place. Frayed jeans are all the rage these days! 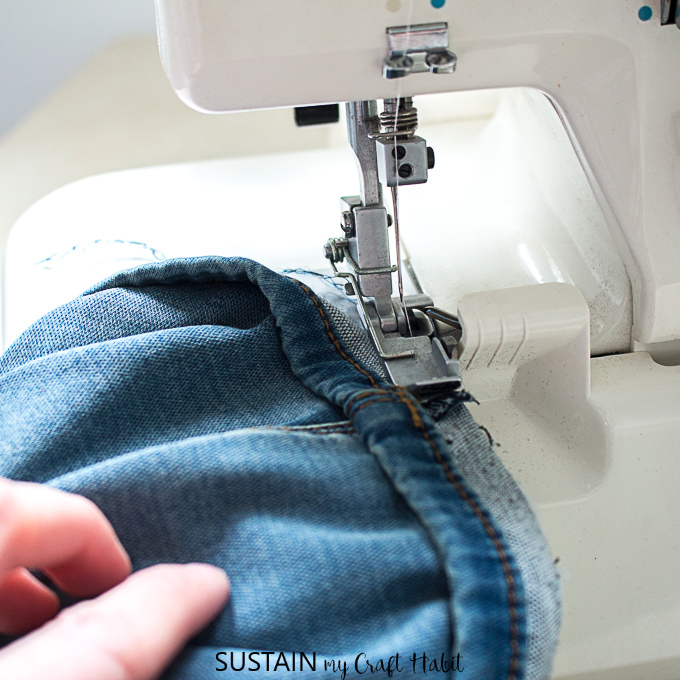 In the next few weeks, I’ll show you how to hem jeans to achieve a professional frayed edge. 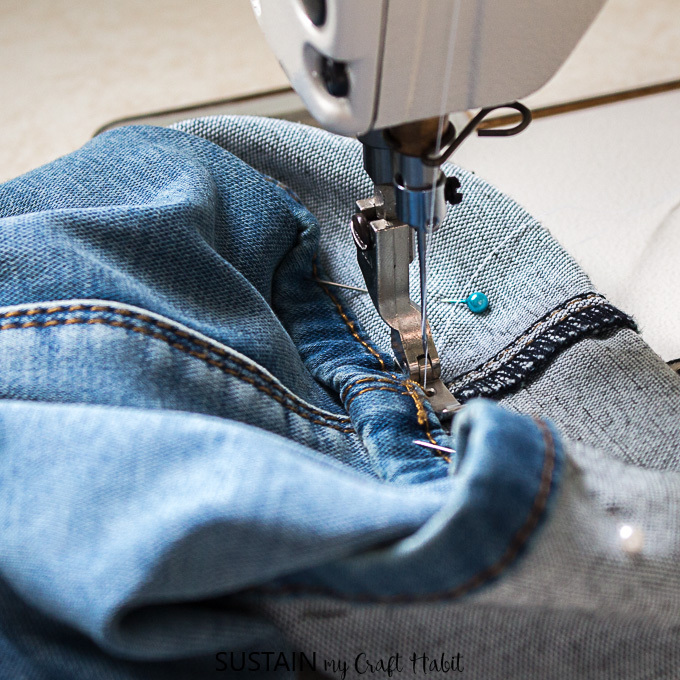 Do you have any tips and tricks for hemming jeans? 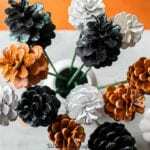 Hi Gaylene, Thanks for your question! 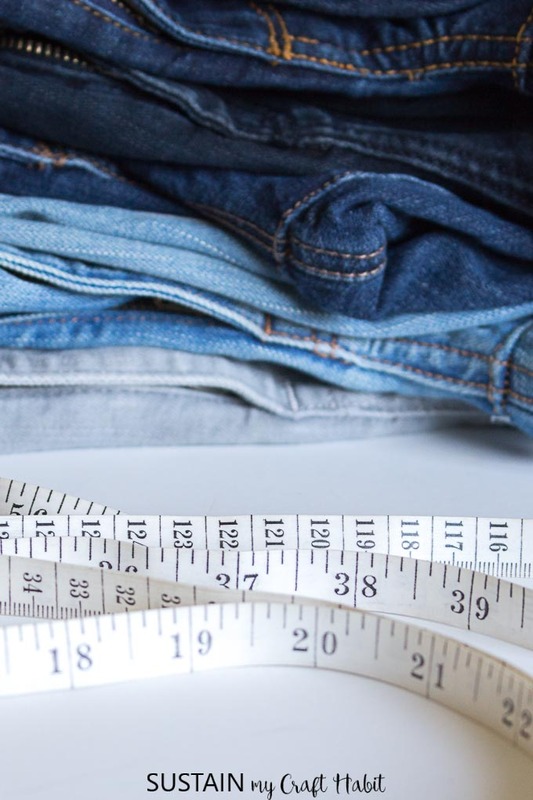 To avoid the puckering and eliminate the excess fabric you need to adjust the inner and outer leg shape (seam allowance) below your new hem line to mirror the leg shape above them hemline. I’ll send you a diagram! Hi! I seem to be having this same problem. 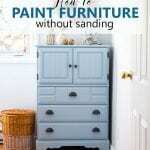 Can you send me a diagram? Can you send me the diagram as well? All of mine that I need to do are not straight leg and really wide bottomed. Thank you so much!!! Hi Virginia, Absolutely! I’ll add it to the post as well for other readers to reference.